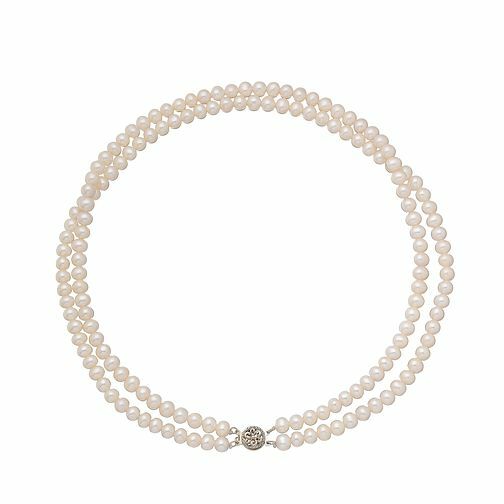 Certified by the International Gemological Institute and including its own certificate, this captivating necklet features a double string of shimmering cultured freshwater pearls and a 9ct yellow gold clasp stone set with diamonds. Uniting vintage perfection with contemporary style, this gorgeous necklet is the perfect finishing touch. Elegant pearl jewellery for every occasion. 9ct yellow Gold Certified Cultured Freshwater Pearl necklet is rated 5.0 out of 5 by 1. Rated 5 out of 5 by Anonymous from Perfect Beautifully packaged, received this so quickly after order. Everything was perfect.